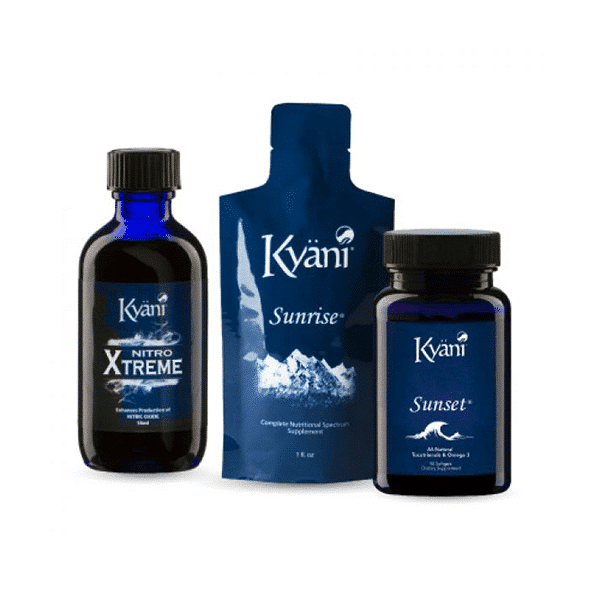 The Kyäni Triangle of Wellness features three key product families: Kyäni Sunrise, Kyäni Sunset, and Kyäni Nitro. Together, the products work synergistically to provide you and your family with hard to match nutrition for optimal wellness. Among many foods and botanicals, the Triangle of Wellness offers the power of Wild Alaskan Blueberries, Omega-3s from Wild Alaskan Salmon, Vitamins C, B Group and D, nitrates from Noni fruit and Zinc, in one easy-to-use system. Experience the nutritional benefits for yourself. Try the Kyäni Triangle of Wellness today! It is possible to buy producst separately. If this is your desire, please write living.minerals@gmail.com. This Kyäni Sunrise pack comes in 30 pouches x 30 ml each. Vitamins and foods including Riboflavin, Thiamin, Pomegranate, Cranberry, Grape, Amla Berry, Panax Gingseng and many others provide Kyäni Sunrise with an amazing spectrum of rich-colored, vitalizing nutrients that provide incomparable wellness benefits. Taken in the morning to provide maximum bioavailability, Kyäni Sunrise will help you experience optimal wellness. Comes with one bottle containing 90 soft gels. Kyäni Sunset is a proprietary combination of EPA and DHA derived from Wild Fish Oils (including Wild Salmon – among the purest source in the world), Vitamin A, Vitamin E and the essential Vitamin D.
Comprised of only lipid-soluble nutrients, Sunset is intended for evening use to maximize bioavailability and absorption. Kyäni Sunseti is balanced lipid nutrition. This Kyäni Nitro Xtreme pack comes in a 56 ml. bottle. Compared to Nitro FX, Nitro Xtreme is a more concentrated blend from Noni fruit juice. Nitrates, found in plants like Noni fruit can efficiently produce Nitric Oxide gas. Nitric Oxide has been researched as an important signaling molecule in the body and effects a wide range of physiological functions. In addition, Nitro Xtreme contains CoQ10, Zinc, Chromium and Niacin (Vitamin B3).